a few guitars,(Rickenbacker/,les paul jr,,,BMI S10 steel,old sho bud maverick....,peavey classic 30 ,Nashville 400,,a few effect pedals,,everything except talent,i discovered I,m the tim tebow of steel guitar(everyone wants to go to heaven,but no one wants to die to get there,) "steven jobs"
Here is a single neck Gibson on Craigslist in my home town. I might go over to mess around with it, as I've never seen one in person. The one you posted looks great. If it were in my town I would go over and check it out (I guess going over and checking it out is more of a Craigslist thing, not an Ebay thing). I wonder how much someone will pay. I wonder if you could flip the pickup plate so the Bass strings are more treble-ee, and the treble strings are more bass-ee? I have the twin to that Electraharp in my shop currently belonging to Greg Leisz. 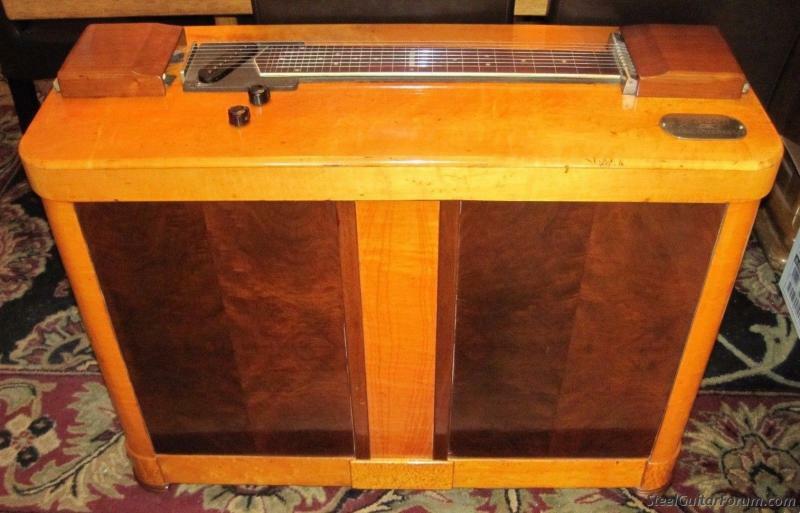 My first pedal steel was an Electraharp. Hated it. Sold it to Rodney Dillard for $75. Pete Grant played it on Wheatstraw Suite. Lol Dan, that was hilarious, I saw the Dillards the first time in Eminence MO in 73. I saw the Dilliards at the University of Illinois, early 70's, as the warm-up band for Elton John (back when he was really good). And of course on the Andy Griffith show. I saw the Dillards in Ipswich, UK, in around 1977/8. They were on a package tour with Karl Perkins and Billie Jo Spears! I only went to see the Dillards (sadly, no Doug) so left the theatre soon after KP came on. The Dillards were in the bar, so I had a magical 10 minutes chatting to them before they went off to the dressing room. Great guys! That would look good in my living room. Great clip! Love the harmony. As a bonus, it's kind of a bluegrass spin on Spinal Tap's psychedelic phase. I give the Hefner guests credit for clapping on 2 and 4 on the first song, anyhow. Posted 8 Jan 2018 6:19 pm banjo player??? the guy playing banjo looks like herb Pederson who was in desert rose band with jay dee maness?? anyone know? In that iteration it is indeed the great Herb Pedersen. Yes he wrote the Hey Boys and sings the lead. There are actually 2 versions of that song. Herb now sings the other version. I still like the Dillard's version a bit better. As for Wheatstraw Suite, I will have to go dig my copy out and recheck, but I thought Buddy Emmons played on that album; or at least the first release. Peter grant is also a Stellar player and he did play with in a later iteration of the Dillards after Herb moved on. Pedal Steel Guitar is "Music from Heaven"
Upon my knock on his door, this was the teacher's response the to yokel looking for lessons: "Two things: get a different steel guitar and get a different bar". Then come back for your lesson...." To his credit, the advice was spot on and he did give me a PSG bullet bar, which I use to this day. Shortly after that episode I bought my second guitar - an early 70's Emmons S10, 6p/2k. Please keep to the pedal steel topic.